Democratic candidates Molly Kelly & Steve Marchand will answer questions on topics of concern to Granite Staters in the White Mountains and North Woods regions. From decent paying jobs, to adequate transportation and social services, to affordable and accessible education and health care, moderator Zandra Rice-Hawkins will cover a wide range of issues. 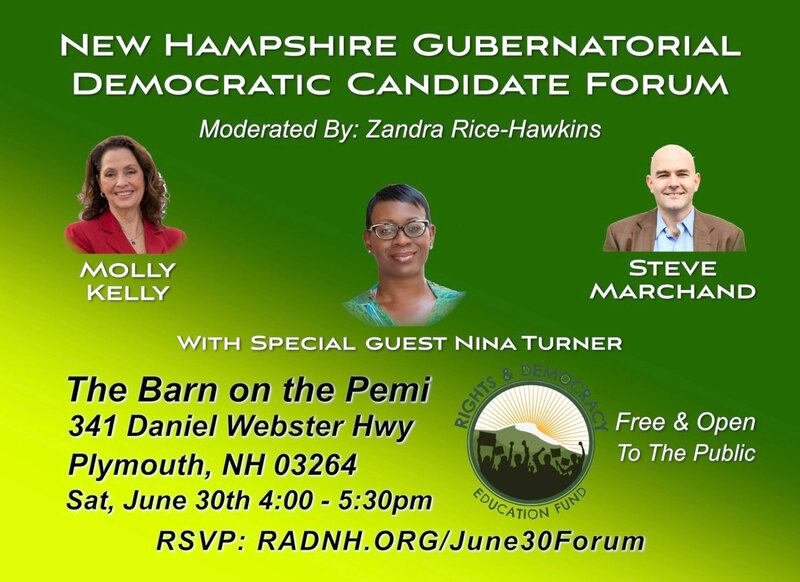 Come hear from the candidates who are vying to be New Hampshire’s next Governor, and hear compelling opening remarks from Nina Turner, the president of Our Revolution! Rights & Democracy has been engaging Granite Staters across the state with a listening tour centered around our Community Survey, asking folks about the issues they are concerned with, where they think the problems come from, and the solutions they think will be most effective. If you haven’t yet taken the survey — take it online right now! It only takes a few minutes and your input is essential as we hear more about what issues you want to tackle to improve our communities throughout the state.